When you are looking for the highest quality summer fuel additive for today's Ultra low sulfur diesel fuel you need to look no further than the REV-X DISTANCE+ Diesel fuel additive product. 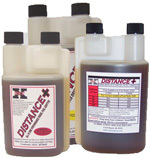 The DISTANCE+ fuel additive was formulated to be a true all in one ULSD fuel additive that requires NOTHING else to be added. DISTANCE+ fuel additive enhances today's ULSD fuel to performance levels that our competitors products just can't touch. Neutralizes Negative Aspects of Bio Blend Fuels (B5 - B20). Increased Detergent and Lubrication Properties. Dramatically Increased Fuel Storage Life.